Hop aboard the desert caravan and go hunting for lost treasure in Pyramids of Giza. Barcrest’s take on the classic Egyptian-themed video slot is a simple one. Played using a 5 reel, 10 payline game engine, it comes with a bonus round that awards up to 20 free games. Play on all devices from between 10p and £500. Many Egyptian-themed video slots are dripping in gold and gems. This is a much more stripped back affair. With the sun-kissed sea in the background, you’ll see lower value A to 10 symbols spinning around the earthy looking reels. The royal values are joined by a trio of higher value symbols. Landing just 2 of each of these in combination result in a winner (albeit a small one). The flower offers awards 0.5, 2, 7.5 or 25 times your total bet. Next come the scarab beetle and eye of Horus hieroglyphs. These pay 0.5, 2.5, 10 or 50 and 0.5, 5, 20 or 100 times your bet respectively. The Sphinx is the game’s wild. This can appear on all 5 reels and substitutes for everything apart from the scatter. The Sphinx can deliver some pretty big payouts in its own right too. A payout of 1, 10, 100 or 500 times your bet is on offer if you land 2, 3, 4 or 5 on a payline. The pyramid is the scatter. 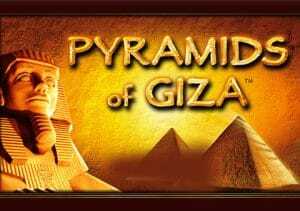 Land 3 of these on the odd numbered reels on the same spin and you’ll trigger the Pyramids of Giza Free Spins feature. Your reward is 10 free spins. Land the scatters again and re-triggers are possible meaning 20 free spins can be won. That’s your lot as far as gameplay is concerned. There aren’t any multipliers or wild extras to spice up the action. Pyramids of Giza is as stripped back an Egyptian video slot as you’ll see. The visuals are simple, the soundtrack generic and the features straightforward. If you’re after exotic features, you’ll find Pyramids of Giza as dry as the desert. If you’re an Egyptologist that fancies a super simple video slot, then that’s exactly what Barcrest has created here. The limited gameplay might be a little dull for some tastes but the volatile action (up to 2,500 times your bet on each spin) gives this ancient adventure some appeal.